My 5-year-old daughter, Zoe, has long been fascinated by my activity monitor. She begs to see the steps I've logged, then asks to wear it around the house herself. So imagine her delight when I brought home one just for her. 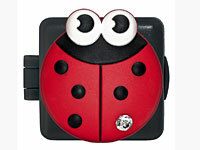 Shaped like a ladybug, it's part of GeoPalz's new line of creatively designed "version 2.0" activity monitors, which measure both how many minutes a child is active and his or her steps. Zoe promptly named her ladybug Madison. We sat down together to set it up—and were ready to go about two minutes later. Seriously, this gadget takes next to no time to program, and you don't have to download a thing. The next morning, Zoe clipped Madison on her waistband and headed off to school. She wore it all day—almost. ("It fell off twice but Miss Jennifer helped me put it back on," she confided later.) I had visions of her tearing around with her pals at recess, then conquering the super-cool playground at after-school care, racking up loads of steps and gobs of activity minutes. The CDC recommends children get at least 60 minutes a day of moderate to vigorous activity, and I had high hopes—I mean, she’s a fitness editor's kid, right? That evening, Zoe and I sat down together and opened Madison’s cover. As expected, she had racked up an impressive number of steps—over 15,000 (it helps that we walk to school). But she had logged just 16 measly activity minutes—meaning those steps didn’t have much heart-healthy pep in them. When asked, she admitted that she preferred hanging out with the teacher to running around on the playground. Sigh. So we made a deal. Zoe promised to try to increase her daily activity to at least 30 minutes for three days in a row. If she succeeds, she'll get a prize. (We're still figuring out what that will be; she's pushing for an ice-cream cone, but I'm not sure "food as reward" is the message I should be sending.) After that, of course, I'll raise the target to 40 minutes, then 50, then 60. Moms are like that. I'd be remiss if I didn't mention the GeoPalz website. It's colorful and simple to navigate, and, even better, Zoe scores points toward cool prizes such as balls, Frisbees, and backpacks if she enters her steps each day (or if I enter them for her). The steps also count toward cute award tags you can earn for reaching different step levels. There's even a place on the site for the rest of the family to corral activity stats from our own monitors (like my Fitbit) so we can compare (and, yes, compete). After five minutes on the site, a pop-up window suggested that Zoe "run around, grab a jump rope, and come back when you have taken more steps." She did just that. I think GeoPalz is onto something—and I'm all for it. If you're looking for your own activity monitor, check back next week to see my review of four hot new options. Pros: A fun, creative way to give your child some serious motivation to move more. Plus, the website is kid-friendly and easy to use. Cons: Nothing major. The display can be a bit hard to read in certain light, and I wonder how long the cover will hold up if Zoe keeps dropping it. Extra tip: Have your child wear it on his or her hip and you can skip the calibration step mentioned in the instructions.